Here you can download AutoIt and related files. 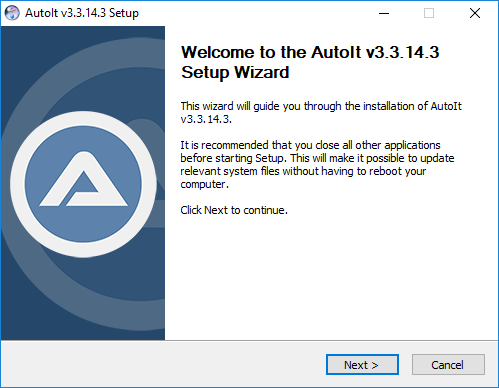 The AutoIt installer and executables have been digitally signed by AutoIt Consulting Ltd. If you get a Microsoft SmartScreen warning after downloading the installer please see the SmartScreen and AutoIt page for more details. AutoIt program files, documentation and examples. Aut2Exe – Script to executable converter. Convert your scripts into standalone .exe files! AutoItX – DLL/COM control. Add AutoIt features to your favorite programming and scripting languages! Also features a C# assembly and PowerShell CmdLets. Editor – A cut down version of the SciTE script editor package to get started. Download the package below for the full version! v3.2.12.1 – Last version to support Windows 95 and Windows NT 4.0.
v3.3.8.1 – Last version to support Windows 2000. AutoIt BETA.You can download the latest AutoIt beta and related files from here. Note: The beta can be unstable – always check the forums. The homepage for the AutoIt version of SciTe can be found here. The syntax files for these are stored in the Extras \ Editors directory of the AutoIt installation.